deShedding Equine Tool, Clincher, Hoof Pick, Hammer, Leather Punch! • Horse deShedding Tool #00137: Horse deShedding Tool provides a Stainless steel 5 inch deShedding edge to dive deep beneath your horse's topcoat to gently remove undercoat and loose hair. Helps your horse shed its winter coat faster and minimize loose hair from shedding. Used and loved by professional groomers for professional results! #00137. ORDER NOW! 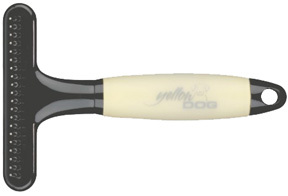 • The Ultimate Hoof Pick: Superior ergonomic design allows for easy removal of the toughest, packed-in dirt. Quick and easy, just like a tool should. Permits good control for picking and good hand grip for holding steady. • The Ultimate Hoof Pick Jr.: BLUE. 6.5 inch. #UH101-R. ORDER NOW! • The Ultimate Hoof Pick Jr.: PINK. 6.5 inch. #UH102-R. ORDER NOW! • The Ultimate Hoof Pick: YELLOW. 8 inch. #UH100. ORDER NOW! • Dog Shedding Blade:Dog Shedding Blade helps control shedding and keeps your dog well groomed and tangle free. Helps reduce the stray hairs left behind during shedding season. 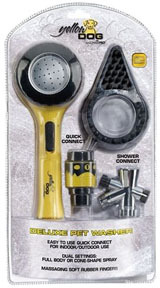 Use the serrated side to eliminate loose hairs and the smooth edge to remove excess water after bathing. This multi-purpose tool can be used either looped or straight. The handle offers maximum control and comfort with its soft, non-slip grip. • Dog Shedding Blade MEDIUM #PGRDSBMD: Measures 13.5 x 1.5 x 4.5 inches; 9.8 ounces. ORDER NOW! • Dog Shedding Blade LARGE #PGRDSBLG: Measures 15 x 2 x 5 inches; 11.2 oz. ORDER NOW! • Dog Pin Brush LARGE #PGRDPBLG: Dog Pin Brush helps control long coats. Made of stainless steel pins with comfort tips that gently and effectively smooth out your dog's fur. Ideal for daily brushing and detangling. The Memory Gel Grip handle provides maximum control and comfort with its soft, non-slip grip. Large: 12.25 L x 4.38 W x 2 H inches. ORDER NOW! • Dog Undercoat Rake 1/2 inch SMALL #PGRDRS: Dog Short-Tooth Undercoat Rake 1/2-inch helps smooth out your dog’s fur and eliminates loose and excessive hair from your pet's undercoat. Helps reduce the stray hairs left behind during the shedding season and gently removes burrs from pet fur. Memory Gel Grip handle provides control and comfort with its soft, non-slip grip. Measures 9.5L x 5.75W x 1.38H inches. ORDER NOW! • Dog Comb MEDIUM #PGRDCMD: Dog Comb Medium provides to comb through your dog's fur in preparation for a trim. Designed with 1 inch stainless steel teeth. Made of durable plastic and metal to effectively and easily remove knots and snarls in your pet's coat with ease. Measures 11.5 L x 3.13 W x 1.5H inches. ORDER NOW! • Cat Comb MEDIUM #PGRCTCMD:Cat Comb gently and easily glides through your pet's coat. Designed with 1" stainless steel teeth, made of strong, durable to comb deeply into the coat, so knots and snarls are removed with ease. Cat Comb is used to prepare the animal's coat for trimming. Unique gel grip handle offers maximum control and comfort with its soft, non-slip grip. Measures 3.1 x 1.5 x 11.5 inches. ORDER NOW! • Shears Round Tip: Round Tip Shears presents exclusive soft-grip finger holes and built-in finger rests to make grooming more comfortable and added control. Designed for fine finishing work and achieving the correct coat length. Rounded tips are perfect for safe facial trimming around eyes, nose and ears. Made of Japanese stainless steel with micro serration for excellent sturdiness and accurate performance. EverGuard-coated blades generate a nonstick, smooth surface. ORDER NOW! • Shears Round Tip 5 inch #PGRDSH5: ORDER NOW! • Shears Round Tip 6 inch #PGRDSH6: ORDER NOW! • Shears Round Tip 7 inch #PGRDSH7: ORDER NOW! • Dog Deluxe Pet Washer #PGRDPWR: Dog Deluxe Pet Washer provides gentle washing and deep cleansing of all breeds. Dual settings offer full body spray or cone-shape curtain spray. Massaging soft rubber fingers for shampooing and deep cleansing. 2 connectors for use in shower or tub, or quick connect to outside hose. 8-foot reinforced hose and 2 spray settings for indoor and outdoor use. ORDER NOW! • Fetlock Scissors: High-quality stainless steel shears perfect for trimming fetlocks. A straight blade roaching scissor with offset handles that lets you to get close to the skin of your horse. The scissors work great and the slight bend at the end. which make trimming easier.Made of high grade polished steel. 7½ inches. #244122. ORDER NOW! • Hoof Nipper: Large opening hoof nipper vinyl handle 15. Red plastic grips on handle.#244209. ORDER NOW! • Leather Punch Pro Revolving Deluxe: Pro Revolving This pro quality leather punch is made of a forged steel frame and has six spare blades. Deluxe Leather Punch with 6 Replacement Punches, 6 Tube Revolving. 9 inch. #244750. ORDER NOW! • Leather Punch German: Revolving German Leather Punch. Punch holes with ease with this high quality German-made leather hole punch. The revolving head contains six different hole sizes. This durable and reliable hole punch will not bend or warp. ORDER NOW! • Leather Punch Red Handle: The Revolving Leather Punch is designed with an ergonomic grip on the red vinyl covered handle that lets you to apply less pressure to squeeze handle. in order to punch through leather. Head is revolving and has 6 tubes. Easy to use and works great efficiency. Ideal for use on leather horse tack! 11 inch. #244742. ORDER NOW! • Rasp Tanged 14": #244230. ORDER NOW! BRUSHES: Leather Punch Deluxe 9"
BRUSHES: Leather Punch Red Handle 11"